Who runs the show at summer meets? 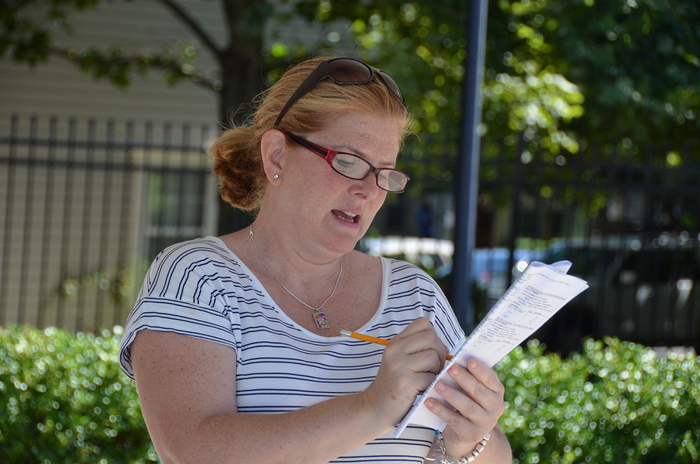 Summer Swim, PVS meets and High School meets require many volunteers at meets. This article will highlight who is generally responsible for the management meets for summer swim teams. Volunteering at meets is the most important thing you can do for your swimmer because they will see that you are as committed to the success of the team as they are. For new parents it can seem overwhelming but it is really quite easy. If you are unsure, find a seasoned parent to show you the ropes! Keep in mind, it takes at least 55 volunteers to run a summer swim meet. Who is in charge of each team at the swim meets? Team Representatives and Coaches share that responsibility. The role of the coaches is fairly obvious. The “A” Team Rep is responsible for overseeing the day-to-day coaching staff and are the team representatives. Another critical position to the overall operation of the team is the Board Representative for the Swim Team. This individual oversees all aspects of the swim team as team administrator, and together with the Team Reps, are the heart and soul of the team. The board members strive to make sure that swimmers, parents and coaches adhere to the codes of conduct set forth by the swim leagues. Who are the “deck officials” dressed in white and blue at meets? There are a number of important parent volunteers needed to conduct an efficient and fair competition, these parent volunteers are dressed in white shirts and blue shorts. 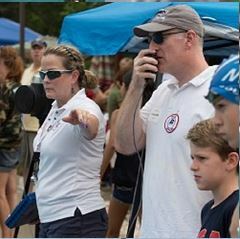 The Referee is the chief official for each swim meet. He or she is responsible for the conduct of the meets and are the final authority on the interpretation and enforcement of all swimming rules. Prior to the start of each race, the referee blows the whistle to advise the participants to get ready. After the event is announced by the announcer or starter, the Referee sounds three short blasts of the whistle as a signal for swimmers to get into position for the start or to jump feet first into the water for a backstroke event. For backstroke events, a second three short blasts is given to bring the swimmers to the wall for the start. When the referee sees that all the swimmers are ready, he extends his arm pointing towards the starter. At this point, the starter takes control . The Starter is responsible for insuring that all swimmers are given a fair and equitable start. The starter will instruct the swimmers to “Take your mark.” After all swimmers are ready and still, the starter will start the race, using a “Colorado System” (so called because it is built by Colorado Timing Systems). This system consists of a public address system, a horn, and a strobe light. Once the race has started, the Stroke & Turn Judges are responsible for ensuring that all swimmers obey all the rules for the stroke they are swimming. These people are always at the ends of the pool for starts and finishes and walk the sides of the pool as best they can within the physical constraints of the pool. If a Stroke and Turn Judge sees a violation of the rules, he raises his hand to signify that an infraction has occurred. A Disqualification is recorded on a DQ slip, which the referee reviews and approves (or not) and forwards copies to the automation workers and the Team Rep.
During relays, you’ll see four Relay Take-off Judges at each end of the pool (two per lane). Their job is to ensure that each swimmer touches the wall prior to the next swimmer in the relay leaving the deck. Each Judge notes on a slip of paper whether each swimmer in his lane left before or after the swimmer in the water touched the wall. Relay Take-off Judges do not raise their hands when they observe an early take-off because a disqualification occurs only if both Relay Take-off Judges observed an early takeoff. The timers are the most important people to every swimmer. They are the people who determine each swimmer’s official time for each race. Being a timer is a good volunteer position for parents new to the sport. Some parents have been timers for years and wouldn’t want to see a swim meet from any other viewpoint. If you can start and stop a stopwatch, you can be a timer. The team even provides the stopwatch. Timers start their watches on the strobe light from the Colorado system and stop their watches when the swimmer touches the wall. There are three timers per lane and all three times are recorded. The middle time is the official time. The Chief Timer collects the time cards from the timers, reviews them for accuracy and completeness, and forwards them on to the table workers. Who else is needed to run a meet? The Clerk of the Course is the “gatekeeper” for all swimmers in our meets. The people who perform this function get the swimmers to the right lanes for the correct race. You can’t run a race without swimmers and the clerk of the course makes sure the right swimmer gets to the right place at the right time. 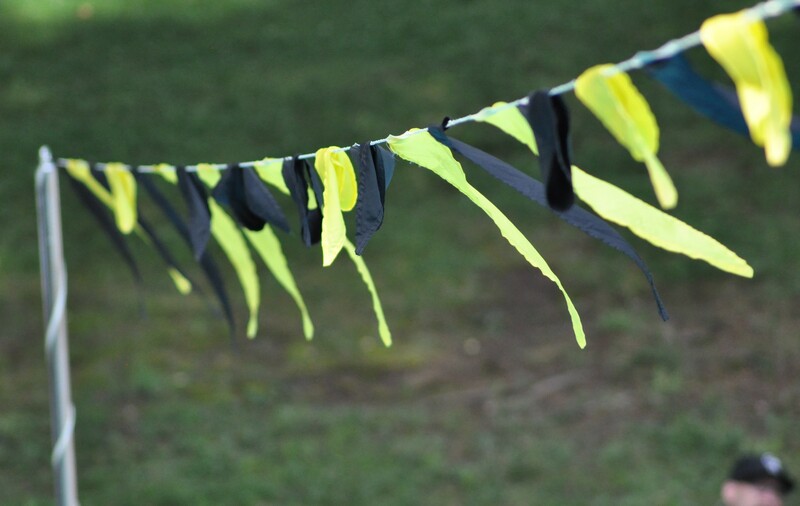 The time cards from the timers and any DQ slips go to the Automation Workers who determine the order of finish for each event, score the meet, and prepare ribbons for the participants. Several people from each team perform these functions to insure that errors are caught before the results are announced. It would be impossible to host a swim meet without a number of people in Other Very Important Positions. These people build and edit the website, set up the pool, and sell concession food and drinks. They also announce the results, run social activities, act as Marshals in the team area and do other jobs that need to be done. 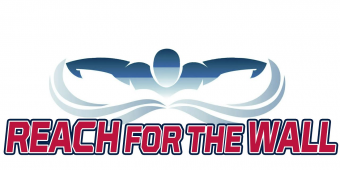 We need the help of every family in order to have a successful swim season. As you can see, there is a job for everyone and plenty for everyone to do! Best of luck to your swimmers this season. And get to work- it is the best job you will ever have. Your explanation of the order of the whistles under the “Referee” section is incorrect. Also, there are no officials walking the sides of “short-course” swim meets (which almost all summer swim meets are). Stroke & Turn officials at the ends of the pool are responsible for judging strokes, turns, and finishes. You are correct. We tried to do a very general overview in this article of all the summer leagues (and swimming in general) so weren’t looking at MCSL specifically.